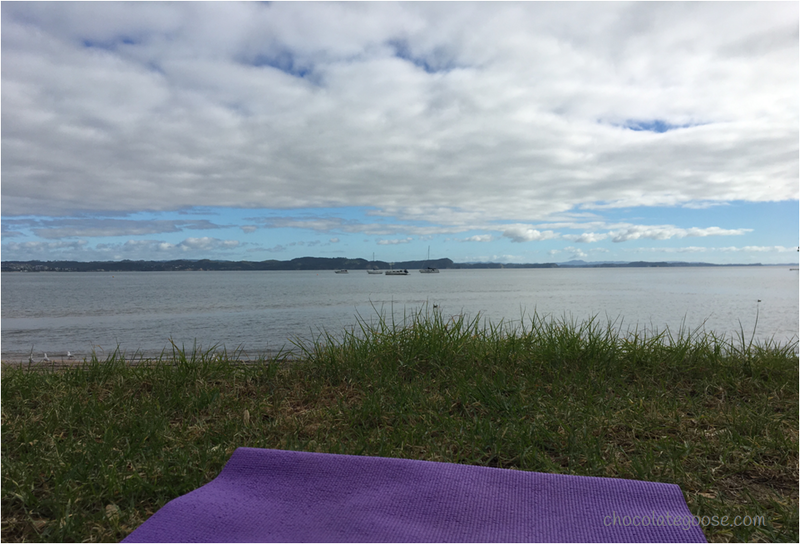 This Summer I’ve had the pleasure of enjoying a free Saturday morning yoga class held at Stanmore Bay Reserve. To understand what a reserve is, you need to understand “Kiwi”…it’s a park or area of green space set aside for sport and recreational activities. This particular reserve has the soccer fields, a park for the children, picnic benches and a whole lot of beautiful sea views. When the weather has been a bit nasty we’ve moved indoors into the Leisure Centre, but the early morning sessions overlooking the beach have been enriching to my soul. Lying there in Savasana, or dead man’s pose, also known as Corpse Pose – don’t worry, all it is is a restful pose lying flat on your back, focusing inwards and centering your emotions and thoughts while calming the heart, breath, body and mind either at the beginning of the yoga session to help focus you into your practise, or at the end to relax and restore you before carrying on with your day. So, as I was saying…lying there in Savasana this morning and becoming ever mindful of my breath and immediate surroundings, training my mind to focus on anything but the list of things I needed to do post yoga, I lost myself in the noises of nature and the human race in the distance. The rhythmic sounds of crashing waves (small ones), the mournful cries of the seagulls, dogs running along the beach offering up the odd bark, the gentle swoosh of the light breeze through the trees overhead and of course the distant yet satisfying sound of a powerboat. Bliss. Feeling the coolness and undulating shape of the earth beneath my body, separated only by my purple yoga mat, accompanied by the smell of the ground around me, it couldn’t have been a better start to the day. The instructor asked the question why anyone would want to go away for the long Easter Weekend break when we have so much pleasure and beauty on our doorstep. I agree. I far prefer not sitting in traffic jams on noisy clogged highways. Happy Easter Folks! Enjoy this time with your loved ones, family and friends. Next week the madness starts again.